UT Women’s Volleyball Coach Kent Miller resigned today to accept a position as an assistant coach at the University of Illinois, UT Athletic Director Mike O’Brien announced. O’Brien added that a national search for Miller’s replacement will begin immediately. 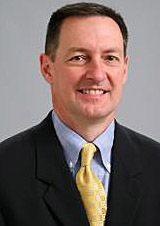 Miller served as the Rockets’ mentor for the last 12 seasons from 1997 to 2008 and helped the program establish 11 team and 14 individual school records during his tenure. Highlighting Miller’s career was the 2005 squad that posted an 18-13 ledger and advanced to the Mid-American Conference Tournament semifinals. The Rockets also registered UT’s best conference winning percentage (.563) in school history that season with a 9-7 win-loss mark, and notched the Midnight Blue and Gold’s first two MAC Tournament triumphs ever. Miller also posted UT’s first winning record in conference play with a 10-8 ledger in the 2001 campaign, which included the second-best overall winning percentage (.607) in program history with a 17-11 mark. “Joining the staff of Kevin Hambly at Illinois is an opportunity to work with one of the premier volleyball programs in the country,” Miller said. “Kevin and his predecessor, Don Hardin, have created a truly unique culture, and I am excited to become a part of it. Academics were a primary focus for the Rockets under Miller. His teams registered the Athletic Department’s highest semester GPA on four occasions, including the squad’s best ever 3.657 GPA in spring 2006 to help give UT the highest team GPA in NCAA Division I volleyball in the 2005-06 academic year. On an individual basis, former Rocket Kate Bean was a two-time first-team selection for ESPN The Magazine’s Academic All-America squad in 2005 and 2006. She was the first volleyball player in school history to earn Academic All-America accolades. This entry was posted on Thursday, February 26th, 2009 at 11:16 am and is filed under News, UToday .